What Your Dentist Website Needs | Infomedia, Inc.
First impressions matter when it comes to patient care. Start things off on the right foot with a reliable and user-friendly website that includes the five features our team describes as “must haves”. Whether it’s knowing what to bring to your first appointment or learning about offered payment plans, websites are a powerful resource for patients. Making your dentistry business as accessible as possible online will bring in more business, keep current patients up-to-date and reflect your professional merit. Read our list below of the five features every dentist website should have. Obviously services are the bread-and-butter of any dentist office, so take the time to highlight everything you have to offer. Display your services either on a large page describing all of them, or smaller pages each dedicated to a service. Things to spotlight include annual checkups, denture care, oral surgery, braces and more. 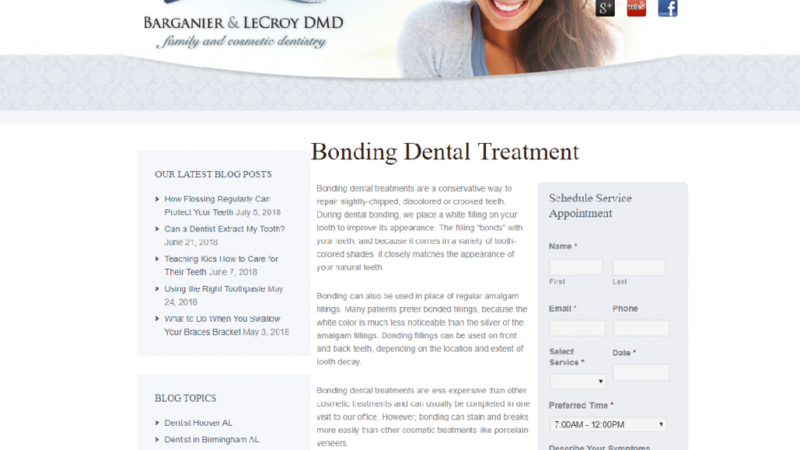 We like how Infomedia client Lecroy Dental writes up detailed descriptions of their offered services. Knowing what to expect before visiting a new dentist office can help prepare patients. Highlight topics like directions for getting to the office, which documents to bring like your ID and dental insurance card, what to expect during a routine oral exam or how to reschedule if something comes up. This can written out in paragraph format or presented in FAQ style. Going to the dentist can sometimes be a daunting experience, even for adults. 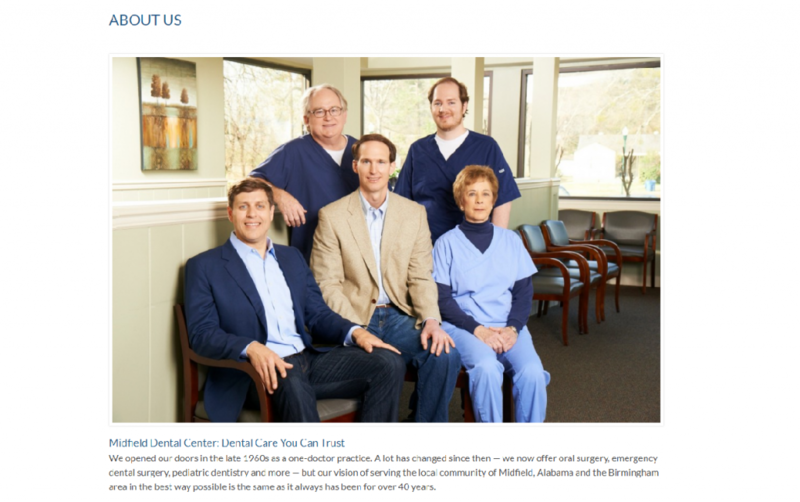 Having an inviting page that displays the dentist(s) and other employees can help them seem more familiar and soothe potentially nervous patients. Of course include important information like credentials and experience, but consider making each employee profile a bit more personable, with information about things like their favorite hobbies, foods and music. Midfield Dental, an Infomedia client, shows off their staff on an informative “About Us” page. Having forms that patients can work on before their appointment can save both the patient and the office time. Information like patient history, change of address and HIPAA release forms are all viable options. These can either be made to submitted digitally or be available as a form to print and bring in already filled out. Putting important financial information on your website can not only reduce the amount of questions called into the office, but it can also help new patients decide on you as a healthcare provider. Seeing what insurances you work with and which credit cards you accept can be a deciding factor for many patients. If you have payment plans available, mention those as well as an option. 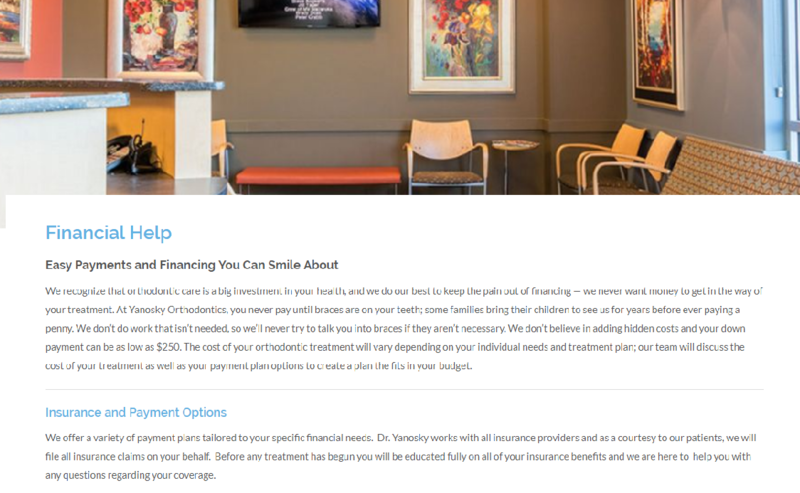 Infomedia client, Yanosky Orthodontics, displays their various finance options and insurance information on a dedicated page. Looking to make your own dentistry website, but not sure where to begin? Reach out to Infomedia for a free, no-commitment consultation. We’ll look over your options and help you get started.